Morning Journal/Patti Schaeffer East Liverpool’s Alfred Todd rolls against United on Wednesday at Walnut Lanes. EAST LIVERPOOL–The East Liverpool bowling teams swept a pair of matches with United Wednesday at Walnut Lanes. The Potters (2-0) won the boys match 2,294-1,966. East Liverpool was led by Anthony DeMarco with a 231 high game and a 445 series. Billy Todd added a 229 high game and a 404 series. For the Eagles, Andrew Hawkins had a high game of 212 and a 397 series, while Preston Davis bowled a 202 high game and a 392 series. East Liverpool won the girls match 1,777-1,491. For the Potters (1-1) Hannah Russell bowled a 199 high game and a 346 series. Madyson McGaffic added a 144 high game and a 260 series. Jessica Walton led the Eagles with a 171 high game and a 304 series. Samantha May added a 137 high game and a 269 series. The Eagles will host Louisville at Forest Lanes on Tuesday. 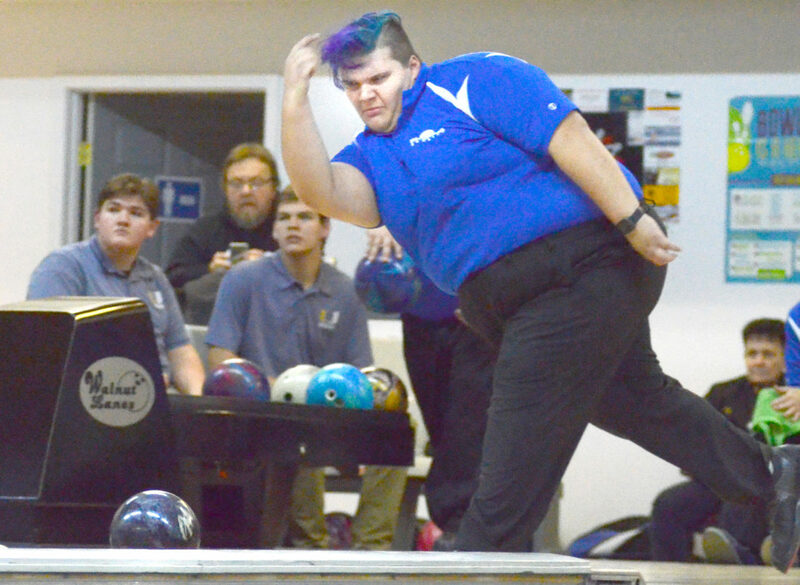 SALEM–The Wellsville bowling teams scored a pair of victories over Heartland Christian Wednesday at Hunt Club Lanes. The Wellsville boys improved to 5-0 with a 2,003-1,542 victory. For the Tigers, Joey Lascola bowled a 186 high game and a 335 series. Cole Corbin added a 179 high game and a 348 series. Zach Labon had a 185 high game and a 342 series for Heartland. In the girls match, Wellsville won 1,699-1,331. Regan Pierson had a 165 high game and a 324 series for the Tigers (2-3), while Olivia Roe contributed a 172 high game and a 316 series. Lehana Vang led the Lions with a 149 high game and a 234 series. The Tigers host Maplewood Monday.